Mataking Dive Resort is a luxury private island resort and a diver's paradise with macro and pelagics. Mataking - The Reef Dive Resort is a private and luxury island resort just forty minutes away from the mainland of Semporna. It is a superb choice for tourists on holiday, honeymooners, spa lovers and serious divers. The Reef Dive Resort features 4 different types of accommodations (Chalets, Villas, Deluxe Rooms) and has the capacity to accommodate a maximum of 70 people. The wooden chalets that make the resort are set slightly away from the edge of the island so that the buildings give the impression of rising from the water, unconnected to the land. Inside those chalets is a miniature world complete with every necessary holiday comfort. Each bedroom has a king-sized bed, satellite TV, large balcony, and a bathroom with a tub as well as shower space. The resort restaurant named The Reef Restaurant has chefs with expertise in local as well as international cuisine, and offers the customer a splendid spread. As seafood is available in plenty, many seafood specialties are prepared every day. Those who come on a holiday will have varied interests, and The Reef Dive Resort caters perfectly to their different holiday needs. There are entertainment venues, provision for water sports, and also arrangements for just basking in the sun and getting scented oil massages in its excellent Jamu spa. All this has been done without in any way damaging the mind-blowing natural beauty of Mataking. The place is treated almost as if it is a reserved area, taking care not to tamper its natural ecosystem. Interested guests are allowed to participate in conservation programs like getting baby turtles hatched safely and releasing them into the waters. 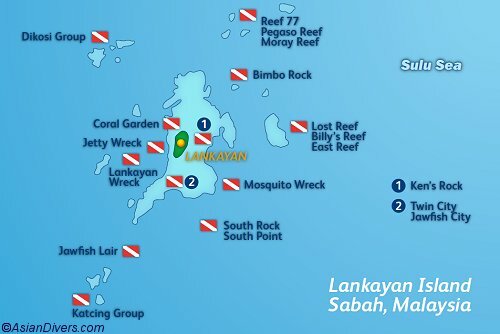 There are excellent diving sites near Mataking, and the nearby island Sipadan is one of world’s best diving places. But diving is definitely not the only leisure interest that one can pursue in Mataking. Though the land area of Mataking is just 40 acres, all of it is not white sand, and there are tropical jungles towards the interior of the island that nature lovers can explore to their heart’s content. The resort can organize sightseeing trips to other islands and important tourist attractions according to the guests’ interest. There is beach soccer and beach volleyball for those who are interested in either of these games. The souvenir shop has plenty of things that you can take to dear and near ones back home, and Coral Bar is a nice place to have a couple of drinks and relax. At entertainment venues, guests are free to have a karaoke night, singing along with prerecorded music. Those who prefer to watch some local entertainment can have it if they make advance request. Mataking has rich marine life and it is an ideal place for macro diving, and also for muck diving, one of the forms of macro diving. There is an abundance of tiny creatures like the pygmy seahorse in the area, and you may meet some special ones with strange camouflages, all of whom you can photograph to your heart’s content. Because there is plenty of coral reefs, divers can do wall diving or slope diving as they prefer. Orangutan crabs with red eyes and body full of red hair, blue and black ribbon eels, frightening barracudas with their blue, green, and silvery bodies, giant frogfishes that change color depending upon where they are sitting, spanish mackerel, and mandarin fishes are but a few of the endless marine species that inhabit the waters around Mataking. In 2006, a wooden cargo ship that was no longer in use was sunk near Mataking to make it an artificial reef as home for fishes and other marine crustaceans and mollusks. A post box was then attached to the wheelhouse of the sunken ship thus making it Malaysia’s first underwater post office. Now divers can post letters in that post office in special plastic wrapped covers and the letters will be delivered at their correct destination. Night diving is quite popular in Mataking because there are many underwater creatures that are active only at night. Sipadan Island, which with its large underwater walls and caves makes a very good diving site, is near Mataking and divers have easy access to these sites also while staying at The Reef Dive Resort. The resort also offer diving trips to Sipadan island (subject to availability). Bumphead parrotfishes, hammerhead sharks, large shoals of barracudas, vast hordes of turtles, and a huge collection of turtle skeleton on the sea bed, are some of the sights you will see when diving near Sipadan Island. The diving courses are designed to meet the needs of complete novices as well as experienced divers, including many PADI specialty courses that will turn ordinary divers into divemasters. Equipment is available for water sports like snorkeling, kayaking etc. for those who do not want to go scuba diving. Because of the wealth of corals, and the clearness of the sea in the area, Mataking is very suitable for snorkeling. You can venture out into the sea for a ‘snorkeling safari’ and explore the sea in more detail. Kookaburra boats, ASL paddles, and Kayaks are available for hire and you can sail around Mataking in whichever of these that you find comfortable. Spa sessions are procedures that will rejuvenate you mentally as well as physically. It will tone up your skin, soften your body, strengthen your muscles, and make you feel light and relaxed. The Jamu Spa of Mataking, near the island’s edge, is a place where you can get your massage and watch the sea at the same time. The Royal Spa Treatments have many types of massages, and cosmetic therapies like facial, foot bath, oil massage, body scrub, and fragrant bath. For those are not interested in any of these, just a whirlpool bath inside a Jacuzzi itself will do a lot of good.